For those times when Windows completely freezes and you can’t even open the start menu, you can also restart your computer from Task Manager instead of just powering the machine off. Doing a hard reset isn’t as healthy for your computer’s internal components, this method would be preferable if possible. Hit Ctrl+Alt+Del and click on Task Manager. 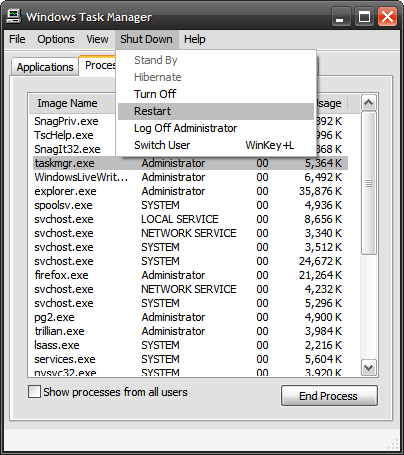 Once you are in Task Manager, you can restart a hung process in the processes list, or you can click on Shutdown \ Restart to restart your computer.